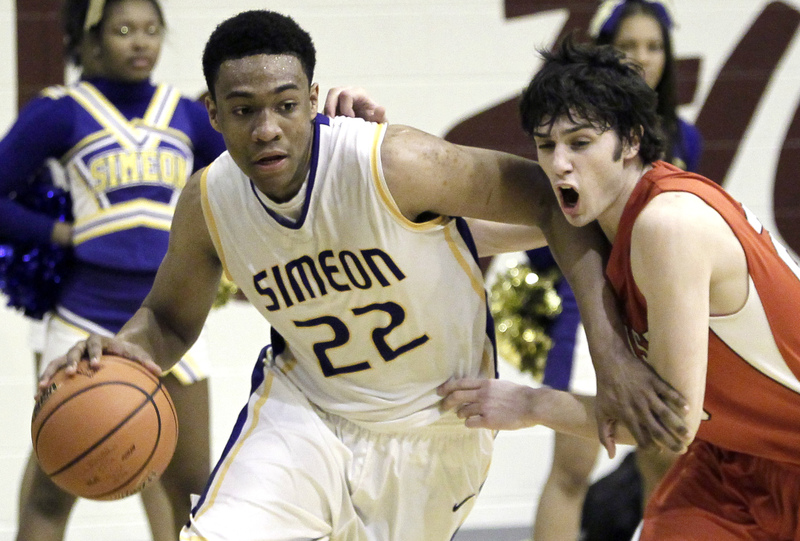 CHICAGO Prized prospect Jabari Parker of Chicago's Simeon Career Academy, one of the most highly touted recruits in years, is headed to Duke. With a national TV audience watching, he announced his decision at a news conference Thursday at his high school gym. Parker can't sign his letter of intent until April 17, but he made his intentions clear with one highly anticipated oral commitment. Michigan State, Florida, Stanford and Brigham Young also made his top five, but he said it really came down to three schools in the end, with the Gators and Spartans right there with the Blue Devils. In the end, he chose to play for Mike Krzyzewski for at least a year before making what many believe will ultimately be a jump to the NBA. "Duke is always going to be a team in the tournament," he said. "You can't go wrong at the program and most importantly, the long-term investment. I feel like if I go there, I can get a good degree. I can also stay close to home where it's easily accessible to my parents, my family. It's not too far away. Coach K, that's one of the best coaches ever, and I wanted to be able to experience the things that he has next year." Parker said he might play two or three seasons in college. Either way, he vowed to get a degree. He also said he didn't decide on a school until about 1 p.m. Central, and he apparently kept his parents in the dark until he made his announcement. According to CBSSports.com site MaxPreps: "Parker is on pace to surpass fellow Simeon product Derrick Rose as the most decorated Chicago high school ever. He has helped the Wolverines win three-straight Class 4A state titles and 66 of their last 70 games." Earlier this year, CBSSports.com's Jeff Borzello wrote that Parker is the No. 1 prospect in the class of 2013, and was the subject of a recent Sports Illustrated cover that declared him the "best high school basketball player since LeBron James." His mom, Lola, said Jabari whispered his decision to her and her husband Sonny as they were walking into the gym. A few minutes later, he pulled out a Duke T-shirt, drawing a standing ovation from the crowd packing the bleachers behind the podium. Parker committed to join a program next season will lose two key frontcourt players  seniors Mason Plumlee and Ryan Kelly  from a team that earlier this week rose to No. 1 for the first time since February 2011. Parker figures to fit right in on a talented group of players that will include Quinn Cook, who's expected to be in his second year as the starting point guard, and returns pure shooter Andre Dawkins, who's expected back after redshirting this season. At 6-foot-8 and with the ability to nail jumpers from just about any spot when he's not throwing down ferocious dunks, it's easy to see why just about every major program was interested in him. Parker just might be the greatest prospect to come out of Simeon, and that's saying something considering Derrick Rose played there. All he did was go on to become the MVP with the hometown Bulls. As for Parker, his credentials sure are impressive. He received the Gatorade Boys Basketball Player of the Year award after leading Simeon to its third straight state championship while averaging 19.5 points and 8.9 rebounds as a junior. His father played six seasons with the Golden State Warriors in the NBA after starring at Chicago's Farragut Career Academy. "He has a gift and he has what's called `It'," Sonny Parker said. He plans to get his degree. Now that he's made his college choice and assuming he doesn't have a change of heart, Jabari can focus on leading Simeon to another state title and getting his conditioning back after being slowed by a broken right foot. The injury over the summer caused him to push back some recruiting trips and delay his decision rather than commit during the early signing period last month. He's also missed a game this week because he's trying to work his way back from the injury, an obstacle for a player rarely stopped on the court, but this moment was years in the making. Lola Parker recalled in an interview at the family's house earlier this year that she could see it when Jabari, the youngest of seven children, was in the second grade going against the fourth and fifth-graders in a league run by Sonny, who established a foundation to help inner-city youth in Chicago after he retired. Scholarship offers started rolling in when Jabari was in the sixth grade. They came from Illinois, Brigham Young, Washington, Purdue and Kansas. UCLA started showing interest, too, and by the time he was in high school, just about everyone was offering. They all wanted a piece of him, and it wasn't just the colleges. Fans mob Parker at games, screaming his name and begging for autographs, and often, they're not even from Simeon. They've seen him on TV or online and just want their brush with him. Usually, he'll accommodate them, but sometimes, he needs an escape. He finds one in religion. That means rising several days a week at 5 a.m. for Bible study and heading from the family's brick bungalow on the city's South Side to worship a few miles away, near the University of Chicago. The day of the interview at the house earlier this year, there was a reminder on Jabari's door to "put the Lord first" along with several sheets of 8-by-10 white paper. One listed the Ten Commandments, the other personal rules such as "don't be quick to judge" and "Think positive things." For now, big things are happening for Parker.